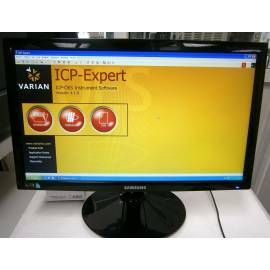 ICP-OES VARIAN VISTA-MPX radial. 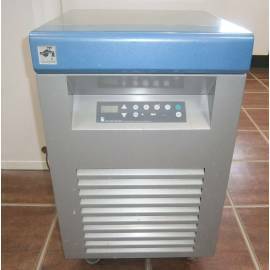 Includes: autosampler SPS3, unit for the generation of hydride VGA 77, nebulization chamber Sturman-Master, nebulization chamber cyclonic nebulizer V-groove nebulizer, Seaspray and stagnation of argon, a PC with windows XP and software ICP Expert version 4.1.0. 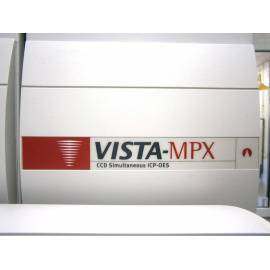 Vista-MPX™ simultaneous ICP-OES ideal for industrial laboratories, chemical and environmental. 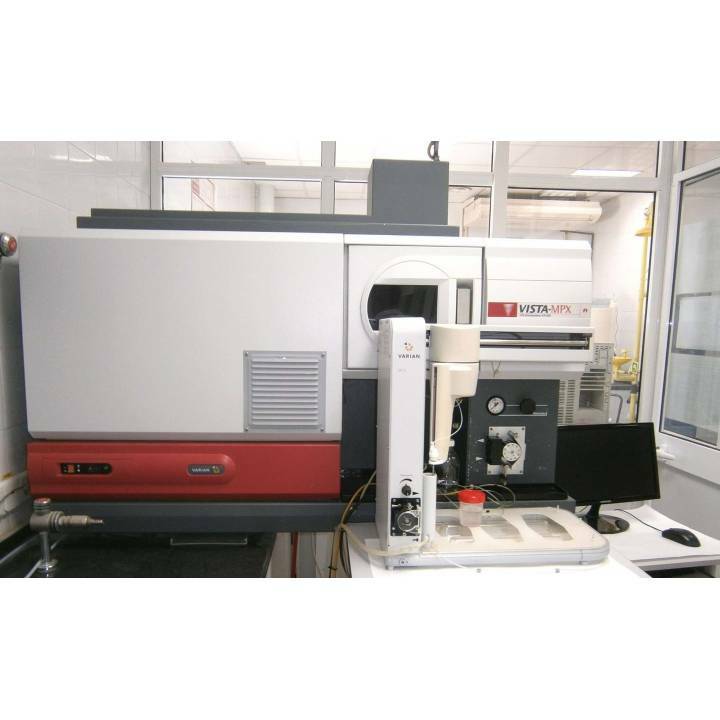 Optical emission spectrometer Inductively coupled plasma (ICP-OES), plasma display radial or axial, RF generator of 40 MHz, air-cooled, chromatograph echelle purged and MegaPixel (MPX) Device (CCD). Nebulization of samples. The system axial sample introduction presents a glass chamber action cyclonic with nebulizer concentric glass and a torch quartz one-piece with an outer tube extended that excludes atmospheric gases. The geometry of the torch is optimized for high precision and sensitivity at low flow rates and low power. 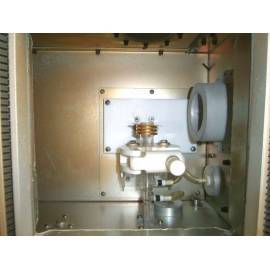 The system radial sample introduction is ideal for samples with high dissolved solids and HF free. It consists of a camera spray Sturman-Masters double-pass and a nebulizer V-groove fabricated with polymeric materials inert. The system of sample introduction is designed for a fast wash. You can get four orders (10,000 x) of washing of the signal for most of the items in less than 45 seconds. Nebulizer gas-to choose between the regulator manual pressure of high precision or mass flow controller controlled by a computer. Gas nebulizer 0-1,3 L / min in increments of 0.1 l / min (MFC). Plasma Gas 0-22,5 L / min in increments of 1.5 L / min. Gas auxiliary 0-2,25 L / min in increments of 0.75 L / min. Choose between a peristaltic pump 2 or 3 channel, 10 roller, under complete control of the PC, including the installation Fast Pump ™ to improve productivity. 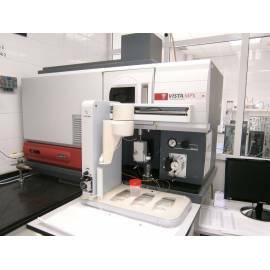 The quick pump makes the pump to work at full speed during the period of absorption of the sample defined to improve the performance of the sample. A peristaltic pump controlled by PC of 3 channels allows for the addition of reagents or internal standards. The peristaltic pump drains automatically output from the camera spray. An accessory of saturation of argon (ASA) is available as an option. The ASA humidifies the gas nebulizer to reduce the nebulizer and the blocking of the tube, injector solutions of high salinity. DIrect Serial Coupling (DISC ™) provides an efficiency of power transfer exceeds 75% in the plasma, eliminating the need for secondary networks secondary inefficient. The stability of the output power is provided through a system of Direct Power Control ™. The stability of the output power is better than 0.1%. Vision system radial plasma oriented vertically and seen radially is ideal for applications of high content of dissolved solids (up to a 30% TDS), providing the ventilation immediate of excess heat and emissions from the plasma to the exhaust ventilation. Includes control full PC of the height of viewing of the plasma from 0 to 20 mm and horizontal adjustment of ± 3 mm to optimize the sensitivity and minimize interference. The height of display can be adjusted under PC control for wavelength. 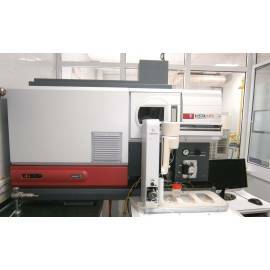 Vision system axial The plasma horizontal view is ideal for analysis of high sensitivity. Provides an improvement of 5 to 10 times the detection limits in comparison with the vision radial. The plasma system viewed axially has a single interface cone cooled (CCI) with a coil resonance anti-arc (AARC) patented to remove the plasma tail cold be seen by the optics. This reduces the interference and improves the tolerance of the system to dissolved solids levels (up to 5% for the daily operation continuous). Gas shear unhelpful. The CCI provides extended dynamic range in comparison with systems axial conventional. Includes full set X, And the display position of the plasma under the control of PC. Ignite and extinguish the plasma is fully automatic and under PC control. For reliability and stability, the spectrometer echelle thermostat does not have optical parts in motion. The policromador echelle has a focal length of 400 mm, and thermostatic at 35 °C. with a cross disperser prism CaF2 and a grating of echelle (94,74 lines / mm) creating a echellograma of 70 orders projected onto the CCD detector MPX megapixel. The policromador can be purged with nitrogen or argon. Polychromator with filter purge gas on line series. The recalibration periodic wavelength based on the emission lines of argon plasma is automatic. This eliminates the need of lamps, Hg, or Ne, which require warming and periodic replacement.